Hundreds of buyers line up for the New Kleinburg grand opening! Last weekend, we popped in at the New Kleinburg grand opening. We heard that people were lining up days before, so we had to see it for ourselves. Turns out it was even busier than we thought it would be. We’re talking about hundreds of people lined up. We had to park along Hwy 27, south of Major Mackenzie Dr., then had to walk up to the sales centres! There are three sales centres for New Kleinburg; Paradise Developments has its own, Fieldgate has their own, and Arista Homes, DECO Homes and OPUS Homes are sharing one. Each sales centre had a long line, winding through the parking lot. We chatted with someone holding a number at the front of the Fieldgate line. They said that they had been there since Wednesday, checking in every three hours for attendance to keep their names on a list. The interesting thing is that the list was not organized by the builders. The eager homebuyers took it upon themselves to create and manage lists for each sales centre. We’re not entirely sure about all the rules in place, but it seemed like you couldn’t be on more than one list, meaning you had to pick which builder you were buying from, and there was an attendance every few hours to secure your spot. The builders handed out numbers based on the list and if you weren’t there when your name was called, then you were moved to the bottom of the list. 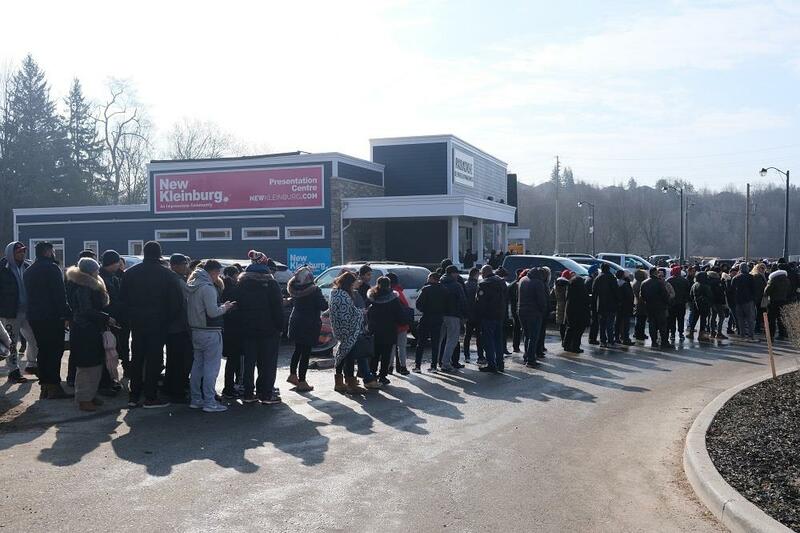 We were only at the grand opening event for about an hour at the very beginning, and everyone entering the sales centres seemed to be happy about the way the list was managed (potentially because they were near the top of the list). There was applause from the crowd when the doors opened at 10am. In an effort to create a comfortable homebuying experience, the builders allowed in small groups at a time. Then when activity in the sales centre eased up, the next few people were allowed to enter. Does this sound familiar? People lining up for days, camping out, lists being made...it’s like it’s 2016 or early 2017 again. The success of New Kleinburg comes at a time when people and the industry are concerned about the effects of the mortgage stress test and expensive single-family housing across the Greater Toronto Area. New Kleinburg featured 38’ and 44’ detached homes from the $900,000s, as well as a limited collection of 30’ detached models from the mid $800,000s. These advertised starting prices are pretty attractive when compared to the Greater Toronto Area’s average price for a new single-family home, which is just above $1.1 million as of the end of February 2019, according to the Building Industry and Land Development Association. February - a typically slower season for new home sales - was actually very busy with single-family home sales increasing 147% year-over-year. The success of the New Kleinburg opening could be a sign that the new home market is in for a busy spring!